Great location. Nice walk along Seine. Easy reach from CDG airport, convenient bus commute. Apartment has its own charm. I had very helpful exchanges with your team beforehand, especially Krystyna who was great to deal with. We had a wonderful time at La Tournelle. I have extensive experience of Paris, having lived there for four years twenty years ago and visited regularly since, but the apartment enabled us to see and enjoy a part of Paris I only knew vaguely. The rental process was very easy and accurate. Le Notre Dame property was fantastic. Great location. Plenty of room. $1M view of Notre Dame. It was directly across from Notre Dame and steps to the great restaurants of Saint Michele area. Friendly and prompt staff. Service was prompt and easy to book. The response time to any questions we asked was fantastic. We met someone upon arrival. She recommended Chateaus to visit and a restaurant to dine at. Also she told us where the walking distance food stores were. Very helpful! Great location to everything we needed. Very nice directions in English on how to use the washer/dryer and oven. The whole team was wonderful - Steven and Veronica responded very promptly to initial requests and emails, Krystyna sent property information in a timely manner and also answered emails very promptly, and Aaron was also always available to answer any questions during our stay. Couldn't have asked for better service. We fell in love with Saint Jacques upon arrival, and that feeling stayed with us for our entire visit! Usually, returning to your accommodations after an exhausting day means the day is essentially over, but with the views at Saint Jacques, the day didn't end until you closed your eyes to go to sleep. Then, upon awaking each morning, there was Paris, beckoning. The location was perfect, with a plethora of boulangeries, patisseries, cafes, and even a fromagerie within a block. A perfect day would be to grab a baguette and fromage and relax in le jardin du Luxembourg...a true Parisian experience. What more could one ask for? Krystyna was brilliant, nothing was a problem and everything just worked so well. Loved every minute at this charming apartment. The apartment was as advertised, spotlessly clean and very well equipped. Any issues or questions were responded to asap! The location, the view and having basic provisions, e.g. coffee, filters etc upon arrival. 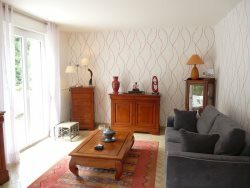 We spent three wonderful weeks at this lovely apartment just four minutes walking distance from every amazing site (Clos Luce, Chateau d'Amboise, cafes, Loire River walk, etc) in Amboise! The caring and friendly owners, Muriel and Michel, welcomed us with warm smiles, regional wine and fresh farm eggs! Muriel kindly helped with our weekly linens during our extended stay. Bed was comfortable, and the kitchen met all our cooking needs.